Vancouver’s Richmond Hospital opens new operating rooms featuring 3D integration technology to facilitate faster patient recoveries and a superior teaching environment with enhanced surgical capabilities. Meditek, a Canadian leader in healthcare solutions, is excited to partner with Richmond Hospital, Canada’s first healthcare provider to open integrated 3D minimally invasive operating rooms. 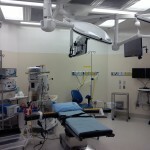 Referred to as AVIOR 3D surgical suites (Advanced Visual Integration Operating Rooms), these new operating rooms combine 3D HD endoscopic technology from ConMed and Skytron’s integration equipment, carrier booms and LED surgical lights to create a better, safer surgical environment for clinicians and patients. The recent opening of the two AVIOR 3D surgical suites marks a new era for Richmond Hospital, which now serves as one of Canada’s leading institutions for minimally invasive surgery. With the new technology, surgeons can make significantly smaller incisions while visualizing each case in 3D on special displays. These 3D images offer surgeons improved depth of field, spatial orientation, accuracy and tissue handling. For the patient, the integrated 3D technology promises less tissue trauma, blood loss and pain while dramatically reducing recovery time. The new AVIOR 3D surgical suites also utilize Skytron OR integration for streaming video and audio, allowing surgeons to perform on-demand consultations with other physicians located within the facility or around the world. Skytron’s unique system allows authorized users to receive streamed video on any computer connected to the hospital network, making such consultations easier than with systems that only offer video conferencing. For teaching facilities, this streaming ability allows medical students and surgical residents to remotely participate in live learning opportunities.